Recently a story circulated about a man who lost his life in a freak accident involving an aquarium, giving rise to the question,"Are aquariums safe?". Although aquariums and associated equipment and products are generally safe, there are some key safety factors to be aware of. In the story of the man who lost his life, the culprit was a simple ten-gallon glass aquarium. The victim consumed alcohol, lost his balance and fell into the tank, breaking it and severing an artery. Is the story true? I haven't been able to verify it, but true or not, this type of accident has the potential for happening. Although aquariums don't break easily, they can be broken. If you have a very active household, do not place a glass aquarium in a high traffic area. Make sure the stand you use for your aquarium is sturdy and will not easily tip over. Teach children to never climb or hang on an aquarium. Better yet, consider choosing an acrylic aquarium if you have children who are climbers. Take care when moving glass aquariums, as they are heavier than you might think. 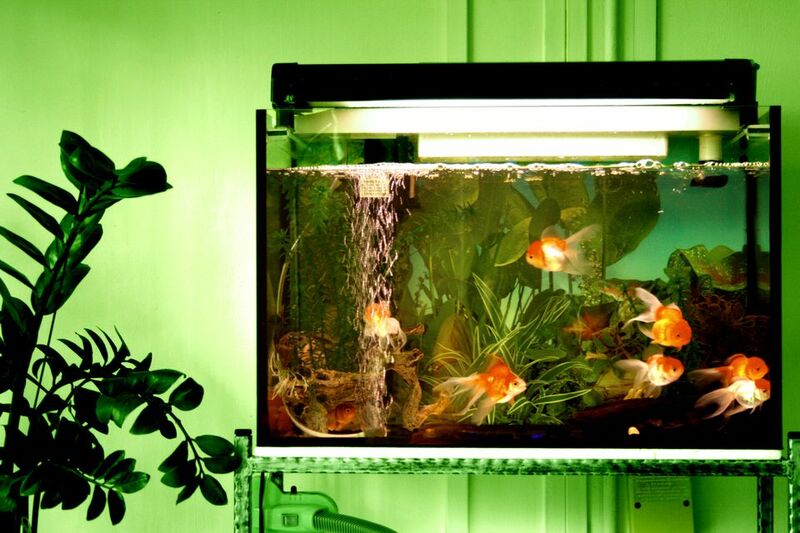 Never move a tank with anything inside, partially filled aquarium, as the risk of accident increases. Keep in mind that generally any warranty on the aquarium (glass or acrylic) is voided if it is moved with anything inside it. The aquarium itself isn't the only injury hazard. Any glass item is a potential hazard. Always take care when working with glass lids, heaters, or other breakable equipment. Don't lay a heater on a counter where it could roll off and break. When removing a glass lid, don't lay it on the floor where you may step on it, or rest it against a chair where it might tip over and break. Take care with small aquarium parts, they can be choking hazards. If you are cleaning a tank, don't leave pieces where small children might find them and put them in their mouth. Frayed wires, broken light fixtures, and cracked heaters can all present an electrical hazard. Make sure all cords are grounded and use 'drip loops' to avoid letting the dripping water run into an electrical outlet. Don't know what a 'drip-loop' is? It's very simple but very effective. Just allow the cord to hang down in a loop below the outlet, so the plug is above a section of the cord. Then if water from the tank somehow runs down the cord, it will drip off the bottom of the loop instead of running into the outlet. Chemical hazards are not a minor thing, as households with small children are at greater risk from this than from breaking hazards. Odds are a small child will not easily break an aquarium, but they will have no trouble opening a bottle of tank cleaning solution and 'tasting' it. Unfortunately, aquarium products are not always in child-proof containers, in fact, most of them are not. Read the labels and be aware if your water treatment or tank cleaning products contain hazardous materials. Store them in appropriate locations where children cannot access them. Surely fish disease cannot be transmitted to humans? Wrong! Although uncommon, fish can transmit a disease to humans under certain circumstances. The notable example is a species of mycobacterium that causes what is commonly referred to as 'Fish TB'. Persons who have weakened immune systems, such as diabetics, are at highest risk. If an infected fish is in the tank, the disease can enter your body through even the smallest cut or scrape on the skin. All you have to do is put your hand in the tank to rearrange a decoration, or scrape algae off the glass, clean a filter, etc., and you can be exposed to the disease. Although this is a low-risk situation, if you have health conditions it is wise to cover your skin when working in the tank. Full length reusable or disposable gloves are available and are well worth the investment. Another excellent tool is a long-handled pair of tongs for situations where you simply need to move or pick something up in the tank. Even if you wear gloves, be sure to wash your hands and arms thoroughly after you've had them in the aquarium. If you are really concerned about the hazards, consider hiring someone else to maintain your tank for you.